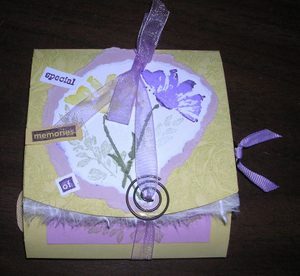 These accordian book kits are so wonderful to give as gifts-they fit into a regular envelope and hold 8-10 pictures...Stampin' Up! 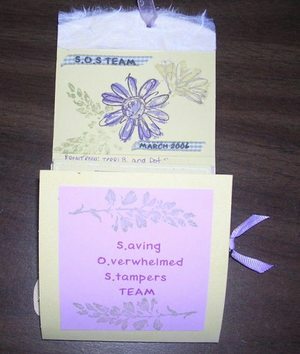 offers these kits which include enough materials to make 2 books per kit, an instruction sheet and 3 each of 2 colors per package (6 12x12 sheets total). There are six color assortments to choose from! I'll be teaching this at a class later in the month, so sign up to receive my newsletter for all the information. See the ribbon above? When you pull it to the right, it reveals a tag that is hidden in the pocket! 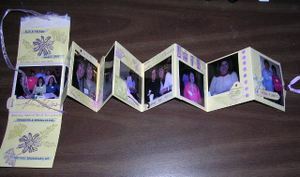 This is a great add-on for journaling or a small photo.. I've used alot of accessories such as buttons, Hodgepodge Hardware, Twill Tape etc. to add visual interest. 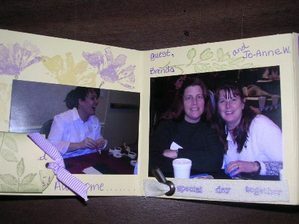 I love making these little scrapbooks...they don't take long either so it's practical when you want to finish a project in an afternoon. If you would like to place an order for these, remember that during February you can get a FREE Sell-A-Bration set with every $50 purchase-but this special ends soon so take advantage of it before time runs out!